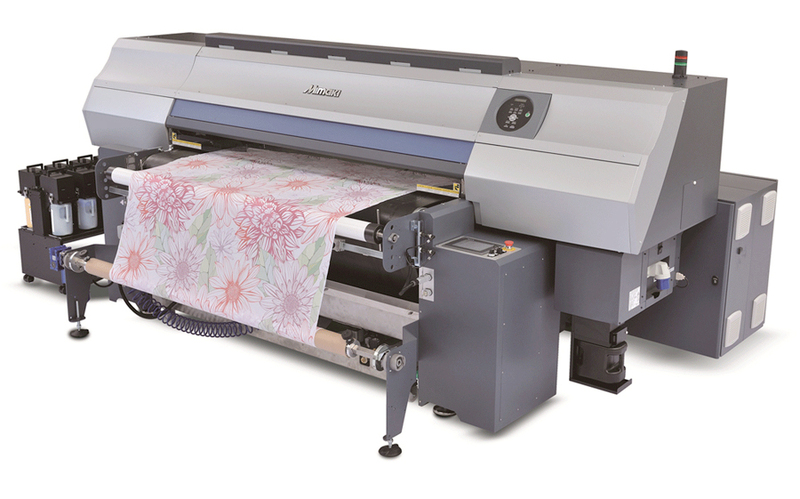 Featuring an automated, belt-fed conveyance system, the Mimaki TX500-1800B is able to print direct to a broad range of natural and man-made fabrics, with a unique combination of both high quality and high production speeds. Capable of delivering long print runs for the fashion and soft furnishing markets, TX500-1800B offers the perfect digital textile manufacturing solution. 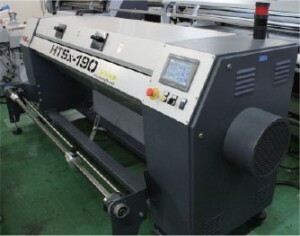 TX500-1800B features newly developed 6 print head technology, in staggered formation, featuring 1280 nozzles per printhead, delivering up to 140 m2/h in 4-colour high speed mode. 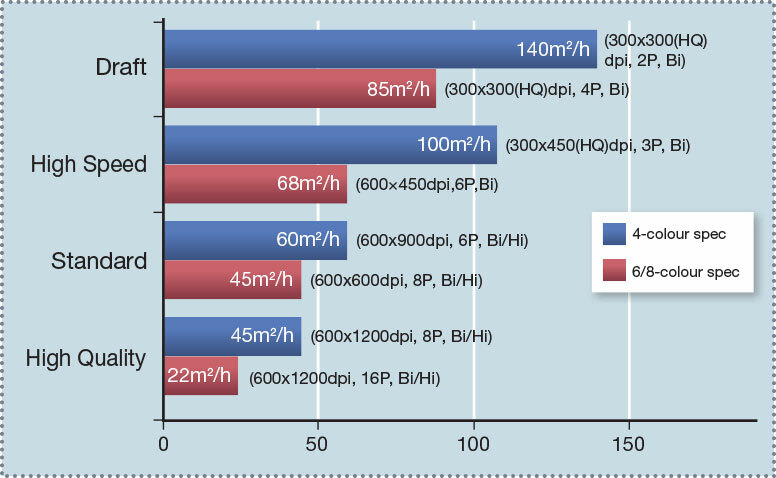 Variable drop sizes of 7 picolitres and 21 picolitres are available. Minimum drop size of 7 picolitres realizes smooth gradation and high-definition print. Image quality is further enhanced with variable dot sizes of 7 picolitres and 21 picolitres, delivering non-granular and smooth print outputs. Correct Feeding Control (CFC) This function reduces and corrects banding issues by measuring the feed rate of the fabric and automatically reducing and correcting the level differences in the joints of the conveyance belt. 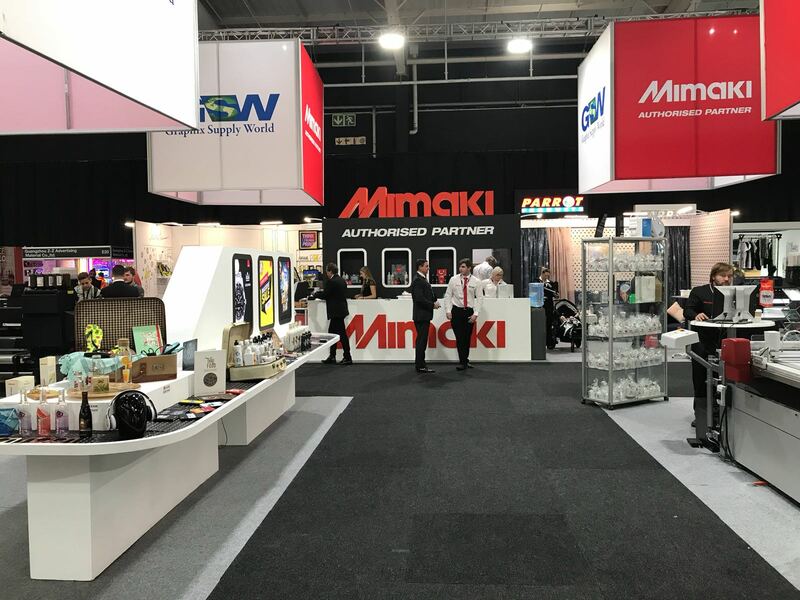 Mimaki Advanced Pass System (MAPS) When banding cannot be eliminated by feed correction, the MAPS function makes it less visible by dispersing pass boundaries. (NB: when using MAPS, the print speed depends on the selected mode) Nozzle Recovery Function In the event of a nozzle malfunction not being repairable by the use of the maintenance function, printing can continue by the use of another nozzle, without any loss of productivity or reduction in image quality. Uninterrupted Ink Supply System (UISS) Two ink bottles per colour can be set with the UISS function. When an ink bottle runs out, another bottle of the same colour automatically starts supplying ink. 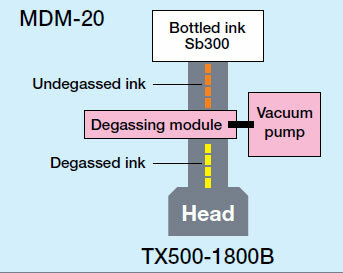 Mimaki Degassing Module (MDM-20) Equipped with MDM-20 which eliminates gasses and bubbles inside the ink, enabling the printer to use bottled inks instead of conventional degassed ink packs, thereby reducing ink costs. You can choose between two types of heaters according to your operating conditions.